Real estate appreciation in Tallahassee is setting records, and one reader wants us to examine this more closely. After yesterday's newsletter was delivered, we received the following question from "Charlie:"
Hey, once upon a time you sent out a snapshot of home price appreciation broken down by zip code. I vividly remember 32303 was in last place and was surprised that it was being outpaced by 32310. You may have done it recently and I missed it, but any chance you can send out an update of home price appreciation broken down by zip code? Our complete analysis is below, but first we show listings in the 32310 zip code which again is doing very well. The 32310 zip code is quite diverse, but the re-emergence of the Lake Talquin area is definitely impacting average prices and average values in a big way. When we study real estate appreciation, there are different ways that real estate analysts go about reporting changes in the market. The most common method is the most flawed, they merely report the change in average sales price. This method fails to compare apples to apples, and often times is reflective of different types and sizes of properties being sold. Another method, which generally provides a more accurate assessment is to compare the average price per square foot of homes sold from one year to the next. This is what we have done. In the graph above, we show the percentage change in existing home sales (meaning no new construction) from 2017 to 2018, and the biggest gainer among all active zip codes in Tallahassee is 32310, where average home values have risen 14.9% already in 2018. Not surprisingly, some of the zip codes that were lagging in the last report have moved up, while zip codes like 32308, 32309, 32312 and 32317 (which declined the least during the housing market crash) are sporting solid gains but not leading the field. The following graph measures the change in home value from the peak of the housing market in 2007 to the bottom of the market for each zip code. Clearly, the 32310 zip code lost the most during the collapse of the housing market, so it makes good sense that it is now leading the recovery in real estate appreciation. These graphs makes one wonder whether its neighbor to the north (the 32304 zip code) is poised for rapid growth? It was the second hardest hit zip code yet still lags most in the housing market recovery. I suspect the construction of all the new multifamily student properties being built near the Universities are the real culprit here however. Value changes are good to know, but you do need to understand average prices to get a feel for where you might shop and what you will encounter there. This graph shows that the top five Tallahassee zip codes have not changed and it is where our company does the majority of our business. From the highest priced homes in Tallahassee (the 32312 zip code), through the Killearn areas, Midtown, the East side of town and then Southwood, the more common place to find homes priced above $200,000 are the first five zip codes. 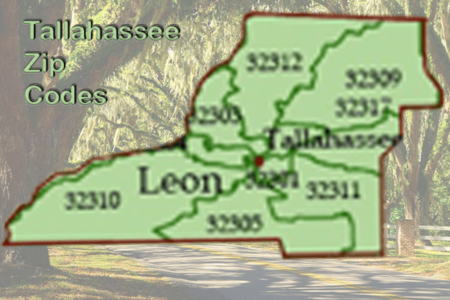 This concludes our report on real estate appreciation by zip code in Tallahassee, please give us a call at (850) 366-8917 or drop us a note if you have questions about anything covered in this report. Looking for an expert in the Tallahassee real estate market? Here's what people are saying about working with Joe Manausa Real Estate, you can see thousands of real customer reviews reported on Google, Facebook and Zillow right here: http://www.manausa.com/testimonials.